Big surprise: I'm a nail polish snob. But I'm either too busy, too lazy, or have better things to do than paint my nails on a regular basis. And I can't seem to justify paying for manicures weekly. When I do sneak in the time to paint my nails, then I go to bed an hour later and the polish ends up all smushed. This does not make for a happy Mel. On a whim, I bought Sally Hansen Insta-Dri purple polish and top coat. My past experiences with quick-dry polishes have SUCKED. I've even tried this exact brand and type in another color and wasn't super-impressed. Obviously I'm shocked enough that I felt the need to share this with everyone. 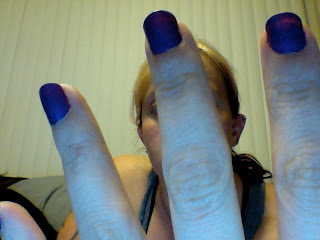 I'm leaving both the color and top coat in my purse makeup bag for future downtime self-manicures.